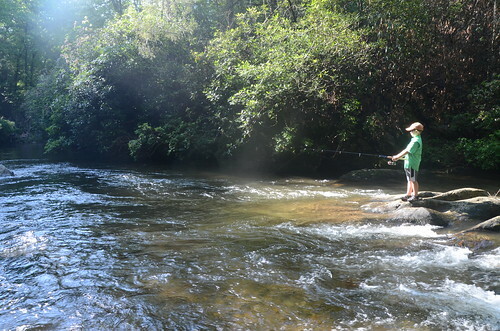 The Chattahoochee-Oconee National Forests provide a wide range of fishing experiences. From relaxing shoreline fishing at places like Lake Russell to the more challenging reward of fly fishing some of Georgia's best trophy trout streams, anglers will find almost any kind of fishing to suit their fancy. Nationally, the Forest Service offers world-class fishing opportunities, with more than 150,000 miles of streams and 2.5 million acres of lakes. Frequently Asked Questions and Answers about fishing on the national forest. Download Geo-referenced Trout Stream Fishing Maps in the north Georgia mountains. Weekly Fishing Report, Fishing Licenses & Trout Stream Interactive Map by the Georgia Department of Natural Resources. 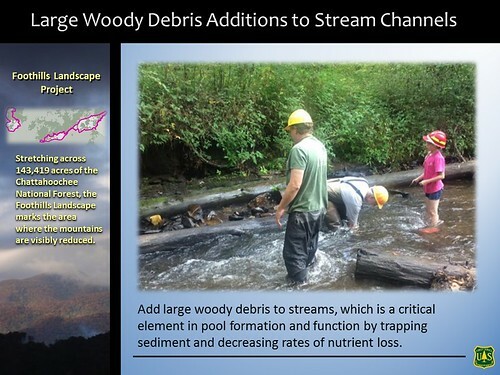 Volunteer with a group to help improve fish habitat on the national forest! Try the Trout Adventure Trail, a DIY conservation education field trip to learn about healthy forests and streams, fish and wildlife. Learn how the U.S. Forest Service manages watersheds to benefit trout, bass and other sportfish. More than 44 million Americans six years of age and older enjoy fishing every year. An average angler spends $1,261 every year on the sport. 33.1 million Americans ages 16+ spent an average of 17 days fishing. Anglers spent a total of $15.5 billon dollars on fishing gear in 2011, and an additional $21.8 billion on trip related items such as food and lodging. Over one quarter of all anglers are female. Hunters and anglers support more jobs nationwide than the number of people employed by Wal-Mart. Through license sales and excise taxes on equipment, hunters and anglers pay for most fish and wildlife conservation programs. Anglers and boaters have paid $3.6 billion in excise taxes since 1952. Recreational anglers spend a staggering $41.5 billion a year to fish. This has tremendous economic impacts. Anglers spend more than $1 billion a year on bait alone.